There are many advantages of filming in Colombia (with Colombian production companies). 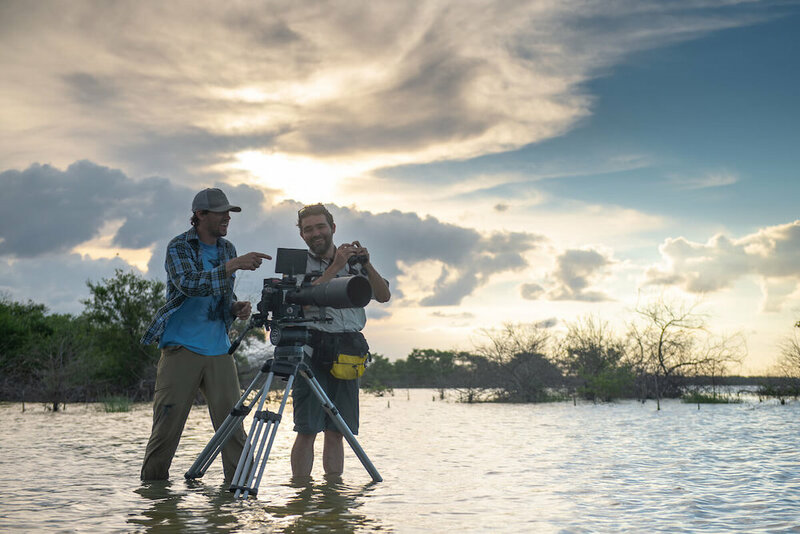 Besides working with talented crews in stunning locations, Colombia has become one of the most cost-effective destinations to make a movie offshore because of two local film laws: Ley de Cine (Film Law) and the Filming Law 1556 (Cash Rebate). *Note these two film laws are not concurrent. So you cannot qualify for the tax incentives of the Film Law and the cash rebates of Law 1556 for a single project. Understanding the laws and how international producers can benefit from them can be a bit tricky. At WhereNext, we field questions about these laws from confused foreign clients way too frequently—so we’ve decided to translate them from Spanish to English and present a concise explanation. In 2003, the government passed the Ley de Cine 814 (Film Law). The goal was to boost local production and to create a sustainable film industry in the country. The law is managed by the Fondo Mixto de Promoción Cinematográfica or “Proimágenes Colombia.” Proimágenes established a Film Development Fund (FDC) to provide incentive grants to Colombian film projects through a competitive application process. Both Colombian-only productions and Colombian co-productions with foreign producers can apply for the grants. As a foreign producer, if you co-produce a film with a Colombian film company, you may qualify to receive monetary resources for financing your project via two methods: a grant from the FDC and/or tax incentives for investments and donations. To be considered a Colombian co-production there are three category requirements the project must adhere to: financial, artistic and technical. Financial: the film must be produced by at least one foreign company and one Colombian company. Colombian investment in the film must be at least 20% of the project. Artistic, Technical: a certain number of positions must be held by the Colombian crew. The numbers change depending on whether it is a feature or short film, documentary, fiction or animation. International investors seeking to receive tax benefits under the law must first get their project approved by the Film Department of the Colombian Ministry of Culture who will issue a “domestic project resolution” if they feel the project is a good fit. To apply for the resolution, you’ll need to prove the project is a Colombian co-production and submit documentation describing the technical and budget feasibility of the project. Since passing the Film Law, over 200 national films have successfully been produced so the government decided to go one step further with with the Cash Rebate - Filming Law 1556. The Cash Rebate Law was specifically created to promote Colombia as the number one place in Latin America to produce feature films. The primary purposes of the Cash rebate - Filming Law is to develop and improve the filmmaking business in Colombia, as well as promote tourism and enhancing the image of the country. The incentive is managed by the Colombian Film Commission, a division of Proimágenes Colombia, and via the The Colombian Film Fund (FFC, acronym in Spanish), allows a cash rebate for films partly or completely produced in Colombia. Foreign production companies opting to shoot in Colombia are eligible to receive a 40% cash rebate on expenses paid in the country on film services and 20% of the amount paid for logistics services. Film services are directly related to pre-production, production and post-production, including artistic and technical services. (Projects that are focused solely on post-production cannot apply for a cash rebate). In addition, it’s mandatory for the foreign film crew to hire the film production services of one or several Colombian film production companies. Logistical services include expenses paid on hotels, catering, transport, and international airfare if bought from a Colombian travel agency. Feature films longer than 70 minutes, short films less than 70 minutes, TV movies of up to two episodes, documentaries or animations will all be considered. (Advertising projects are excluded). The minimum spend is USD $600,000 on film services and logistics services. If your film complies with these two points, you are eligible to apply. Documents must be submitted in their original language and translated in Spanish. The evaluation process can take up to three months as the project needs to be assessed by several governmental boards. If your production is accepted, the contract must be formalised within 20 days of being notified by Proimágenes Colombia. You will also need to set up a trust fund with a minimum amount of 10% of the total expenditure you plan to spend in the country. To be eligible for cash rebates, all of the payments for the film and logistics services should be made within 6 months of signing the contract; 12 months if it includes post-production and 24 months for animation projects. As the FFC is funded by the government’s National Budget, the available resources are limited and amounts change every year. Also, even if your project complies with all of the requirements, it may not be approved if your production doesn’t suit the specific goals of the law – advancing the local film industry and giving a shout out to the world that Colombia is an excellent place to produce films. Since the law came into effect 2012, 40 project applications have been accepted, 32 have received cash rebates (8 were eventually deemed ineligible).